A new food product range from leading Mexican restaurant group Wahaca launches today nationwide. Developed by Wahaca co-founder and MasterChef winner Thomasina Miers and her team, in partnership with All About Food, the new Soft Taco Kits and Mexican ingredients range will, for the first time, give fans of the restaurant – whose Cardiff outpost opened in 2014 on The Hayes – the opportunity to experience a taste of Wahaca’s authentic Mexican street food at home. Inspired by Thomasina’s travels around Mexico, Wahaca was born in 2007 when she and co-founder Mark Selby set about recreating the flavours of Mexico’s vibrant street food culture within a restaurant setting in the UK. Almost 10 years later and Wahaca is widely recognised as the UK’s leading Mexican restaurant group. Only last week Thomasina and Mark were awarded ‘Restaurateurs of the year’ at the prestigious annual Catey Awards, and the group’s successful ‘Year of the taco’ campaign is continuing to raise awareness and create new fans of Mexican food and culture. Until now the true taste of Wahaca has only been available at each of its award winning street food restaurants, however with the new Wahaca Soft Taco Kits and product range launching exclusively in up to 900 Tesco stores from 25th July (and via www.tesco.com/wahaca), Mexican food lovers nationwide can now also enjoy its great flavours at home. Authentic and simple to use, the new Wahaca Soft Taco Kits are suitable for the most experienced cook through to the most novice foodie who want to make great tasting Mexican street food at home. With tortillas, marinade and a delicious salsa included in each kit all that’s left to add is a choice of meat, fish or veg and a splash of oil to create the perfect taco in 30 minutes or less. The full product range includes three different varieties of Soft Taco Kit (RRP £3.69), each varying in its level of heat, ranging from mild to hot, with flavours to suit all tastes. For those looking for a mild option, the ‘Tomatillo & garlic mojo’ kit comes with a garlic and chipotle marinade and a tomatillo salsa, making a mild-yet-tasty taco. For the more adventurous, try the ‘Tomato & smoky chipotle’ kit, containing a smoked tomato and chipotle marinade and chipotle salsa. Chipotle chillies are a national favourite in Mexico, used in vibrant tasting salsas and marinades commonplace throughout the Southern and Central streets of the country. The third option, only for the bravest spice-loving souls, is the ‘Fiery habanero & achiote’. This kit provides maximum heat and makes good use of the habanero chilli, which is similar in flavour to the more commonly known scotch bonnet chilli. This kit combines the vibrant, brick red achiote marinade used in some of Wahaca’s most popular dishes, with the devilishly hot habanero chilli salsa – this one is certainly not for the faint-hearted! For those wanting to experiment and create new Wahaca-inspired recipes themselves, the range also includes a collection of individual ingredients, available to purchase separately. This includes both the ‘Tomato & smoky chipotle’, and ‘Garlic & chipotle’ marinades (RRP £1), as well as the two delicious ‘Tomatillo’ and ‘Chipotle’ salsas’ (RRP £1.79). The flour and yellow corn tortillas are also available separately in a pack of 10 (RRP £1.40). These replicate some of the unique varieties of tortilla available in Southern Mexico made from freshly milled yellow corn, then filled with delicious fresh and vibrant, spicy salsas. 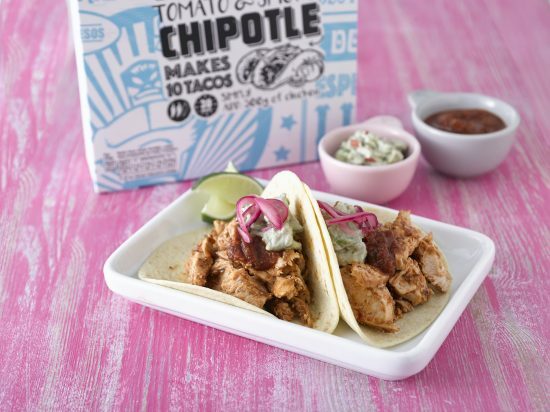 The full range of Mexican ingredients will be available alongside the three Soft Taco Kit options (RRP £3.69).